About a year ago, I went to a meeting of the Historic Preservation Board of the City of Homestead and learned that one of their items of interest was to designate the former Southern Bell central office, located on N.W. 2nd St. behind the former Breedings Drug Store on Krome Ave., as a historic building. Since I had retired from Southern Bell/BellSouth/AT&T after 34 years, that project intrigued me but I had no time to devote to it. Now, though, since I’m researching early pioneers in the Homestead area, I’ve been able to learn a few tidbits that have led to some interesting discoveries about the origins of the telephone company in Homestead. I got my first clue by reading in Jean Taylor’s book, The Villages of South Dade, that in 1912, J.U. Free opened the People’s Telephone Company on the second floor of J.D. Redd’s dry cleaning shop (wrong on all counts). To establish his telephone company, J.U. Free “bought out the three circuits owned by Walter Frazeur.” That was also not true. For an account of how the Dade County Telephone Company came to be, read this post. Who was Walter Frazeur and where did he come from? That is the subject of this post. Many serious family history researchers don’t think much of the information available on Ancestry.com because much of it is unsourced or copied from other trees without much thought by members. Those are valid reservations, but the information is, like Jean Taylor’s book, a good starting point. Thus, I went to Ancestry and found a public tree that included Walter Arthur Frazeur. He was born on May 26, 1875 in Goodland, Newton County, Indiana, the son of Walter Gilette Frazeur (1849-1916) and Almeda M. Harris (1850-1921). Walter and Almeda were married in 1868 and started a family. Their daughters Lillian and Gertrude were born in 1869 and 1871, respectively, in Illinois. By 1888, the Frazeur family lived in Topeka, Kansas, where Walter and his brother Ben were commission merchants for Frazeur Bros. On January 17, 1907, Walter G. Frazeur, of Topeka, Kansas, filed a patent for “a gas burner attachment for stoves, furnaces and the like …” It seems that Walter G. Frazeur was something of an entrepreneur and he seems to have passed that trait on to his son, Walter A. In about 1904, Walter A. Frazeur married Ora Phena Benning and started a family. His daughter Thelma was born in March 15, 1905, Gertrude Adele in about 1908 and Robert Stone on October 28, 1909. Ruth Beatrice was born in 1912 and their last child, Walter G., Sr., was born in 1914. Walter came to this area sometime before April 9, 1910, when he filed his claim for 160 acres of land in the SE quarter of section 33-56-38 in the Redland. This property is bounded on the north by 272 St., the south by 280 St., the west by 212 Ave. and the east by 207 Ave. Like so many other settlers, he may have worked for the Florida East Coast Railway. 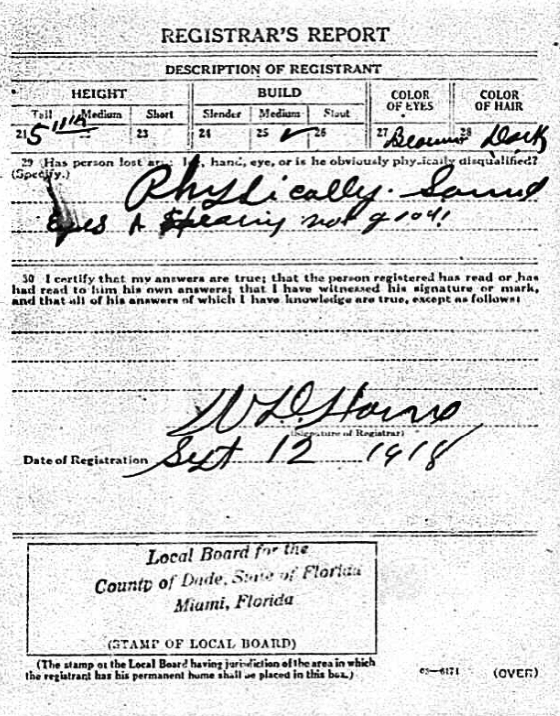 His WWI draft registration card, dated September 9, 1918, says that he was a carpenter employed by the Key West Electric Company. His wife, Ora, resided in Homestead while he lived in Key West. Interestingly enough, the draft card spells his surname as “Frazier” but he signed his name as “Frazeur.” His family continued to grow after he moved to this area, as Ruth was born in about 1912 and Walter G. in 1914. Walter A. Frazeur, who was an engineer for the McAllister Hotel in Miami at the time, was murdered on December 14, 1922 by Louis Stephen Blocker, who in 1920 lived in “Naranja Village” and probably worked at the Drake Lumber Company sawmill in Princeton as a manager. The Drake sawmill closed down in 1923 and Blocker may have been negotiating with Frazeur over the purchase of a sawmill when the murder occurred. According the newspaper accounts from the time, Blocker accused Frazeur of stealing everything that he (Blocker) owned. Blocker was tried and convicted of first degree murder, appealed, was convicted of second degree murder and was sent to Raiford prison in Starke, Florida before being pardoned and released in November of 1927. He died in Miami on March 14, 1949. At the time of his death, Walter left a substantial estate. In addition to his homestead, he owned lots in Tatum’s Ridgedale subdivision, Tatum’s addition to Homestead, the Boulevard addition and the R.L. Moser 2nd addition. Walter left his widow and 5 young children. Ora appears in the 1930 census with Robert S., 20, and Walter G., 15, living in her household on S.W. 2nd St. in Homestead. Robert S. was Robert Stone Frazeur and was named after Walter’s sister’s husband. Robert, known to many in Homestead as “Bobby,” walked the streets of downtown Homestead, always dressed in a suit. He rang the bell for the Methodist Church on Sunday mornings and people noted that they could set their watches by when the bell was rung. Walter Gillette Frazeur, Sr. married Janet Lenora (known as “Elnora”) Simpson on January 2, 1937, probably in Homestead. His son, Walter G., Jr., was born in Key West on July 25, 1937 because his mother had gone there to visit her sister. When the time came for Walter to appear, his mother could not return to the mainland quickly because the Key West Extension had been destroyed in the Labor Day hurricane of 1935 and the Overseas Highway was not yet complete. Walter, Sr. owned an automobile repair business in Homestead and his son, Walter G. Jr., worked for him. Walter, Jr. died on February 20, 2015 in South Carolina. Thelma Frazeur married first Philip L. “Ben” Jenkins (1898-1963), who is buried at Palms Woodlawn. “Ben” Jenkins’ parents, Philip L., Sr. and Georgia V., are buried at Palms Woodlawn also, but they died in Eureka and Bradenton, Florida, respectively. Philip L. Jenkins, Sr., a school teacher, was another early settler in this area. He claimed 160 acres in the area of Eureka Drive and Naranja Road in 1901. Her second husband was a Mr. Pitts and her third husband was John F. Bogusky. Thelma and John are buried at Palms Memorial in Naranja. Gertrude Anita Frazeur married Armando Alfonso, a descendant of King Alfonso VIII of Spain, in Key West. He is buried in the Key West Cemetery. Ruth Beatrice Frazeur married Mario V. Alfonso in 1929 in Dade County. He was a brother of Armando and worked as a steward for Pan American World Airways in Miami. It would be interesting to find out more about Walter Arthur Frazeur. He apparently was a man of many talents, a trait that seemed to have run in his family, as he was a carpenter, built the first telephone network in Homestead, owned a sawmill and speculated in real estate. In my post on James Daniel Redd, Jean Taylor was the source of my statement that Redd was appointed to succeed Walter Tweedell, who resigned due to his failing health. In my post on the Women’s Industrial Club of Detroit, I mentioned Tweedell again, when he and another Commissioner received a letter from the trustees for the Internal Improvement Fund in early 1915 instructing them to take steps to prevent trespassing on the lands that would become part of the new Royal Palm State Park. Jean Taylor’s book, The Villages of South Dade, mentions Walter Tweedell only briefly, so I thought I’d try to find out more about him. Walter Jackson Tweedell, referred in the newspaper accounts in this area as W.J. Tweedell, was born on January 4, 1876 in Gordon County, Georgia. His parents were James A. Tweedell (1836-1907) and Nancy E. Groover (1840-1919). His grandfather, A.W.H. Tweedell, judging by the prominence of his monument and the fact that he was a minister, was probably the preacher at the Sugar Valley Methodist Church in Sugar Valley, Gordon County, Georgia. In the 1880 census of Sugar Valley, Gordon, Georgia, James A. and Nancy E. Tweedle are enumerated, along with their children: Sion, 9, Maggie J., 7; Walter J., 5; Thomas A., 3, Ervin, 1; and James’ father, Alexander W.H., 67. According to Ervin G. Tweedell’s WWI draft card, he was born on May 25, 1879. The next appearance of Walter J. Tweedell is in the 1900 census of Cocoanut Grove precinct 4, in Florida. No doubt, he rode Flagler’s train to Miami and then walked further south. In that census, he and his brother Erving G. (Erving Groover) were living in the household of Charles and Melvina F. Gossman, with their children Henry A., Jesse E. and Charles W. Interestingly enough, there was another lodger living with the Gossmans of interest to those of us here in South Dade: Will Anderson, born in September 1878 in Indiana. According to an article in this same source, there were two stores in Cutler: Tweedell Bros. and Brown & Moody. Brown & Moody later moved to the Naranja area – the Moody of Brown & Moody was George Washington Moody, for whom Moody Drive is named. The restored Richmond Inn is located on the grounds of the Charles Deering estate, at Old Cutler Road and Richmond Drive. Being in the grocery business in Cutler must have been a short-lived venture, probably because the town of Cutler started to decline. That decline was due to Flagler’s railroad being built in 1903 on the other side of the marl prairie which separated the Cutler ridge from the pine rockland to the west. In 1905, Walter homesteaded the S 1/2 of the SE 1/4 of 14-56-38 and the N 1/2 of the NE 1/4 of 23-56-39, proving up his claim on December 12, 1910. That property is on the west side of Redland Road, from S.W. 236 St. up to S.W. 228 St.
Erving, Walter’s brother, stayed in Cutler. On June 27, 1905, he married Amelia Louise Morrow in Key West. They returned to Cutler to live, where on September 6, 1906, a son was born to them. Unfortunately, he died at the age of one day. Erving was elected to the County Commission twice, representing Cutler, before resigning in 1907 and moving to Miami to go into business. At that time, he and his wife lived on 21st Street near Avenue D. He didn’t stay in Miami long, though, because by 1908, he and his wife had moved to Tampa. In 1915, he, his wife, and their daughter, Louise, were in Lakeland, where he owned a grocery and meat market. The political and entrepreneurial spirit of the Tweedell brothers continued after their brief foray into the business in Cutler. On February 4, 1904, Walter married Maisie I. Park in Key West. That was before Flagler’s railroad had reached Key West, so Walter must have been in Key West for some other reason than to go courting. Since he and his brother owned a store which sold “family groceries”, perhaps he was buying merchandise for it. At that time, Key West was a much larger city than Miami. In the 1900 census, both Maisie and her parents were shown as having been born in the Bahamas. That wasn’t unusual at all – there were (and still are) quite a number of Conchs who trace their ancestry to the Bahamas. Their son, Carl Lee Tweedell, was born on January 3, 1905. On May 28, 1911, Walter is mentioned in a Miami Herald newspaper article concerning the activities of the Democratic committee in Dade County. He was representing Redland. He probably didn’t stay on his homestead for too long after proving up, though. Most likely, he, like many others, sold out to some newcomers for a good profit and moved into Homestead. In April, 1912, he won the Democratic primary and in November of that year won the general election for the County Commission seat representing Homestead. He defeated Roy O. Marsh, a surveyor whose name appears on many early plats in the south end of Dade County. According to the Miami Metropolis of September 1, 1911, Walter bought J.U. Free’s store in Homestead, the one that Free built across from the depot, not the new store that was located south of the Redland Hotel. That one was built later. 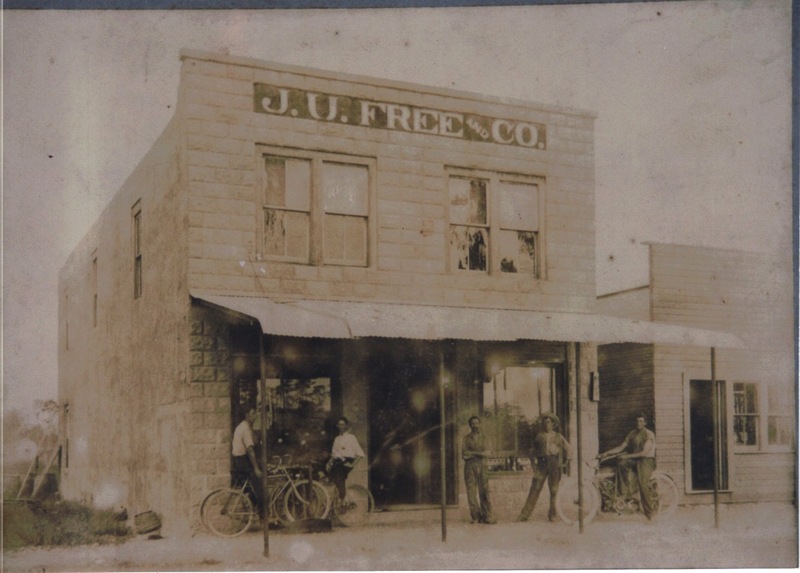 Despite what Taylor wrote in her book, Tweedell’s store was more than a grocery store – it was a general merchandise store, like the new store that J. U. Free opened further down Flagler. 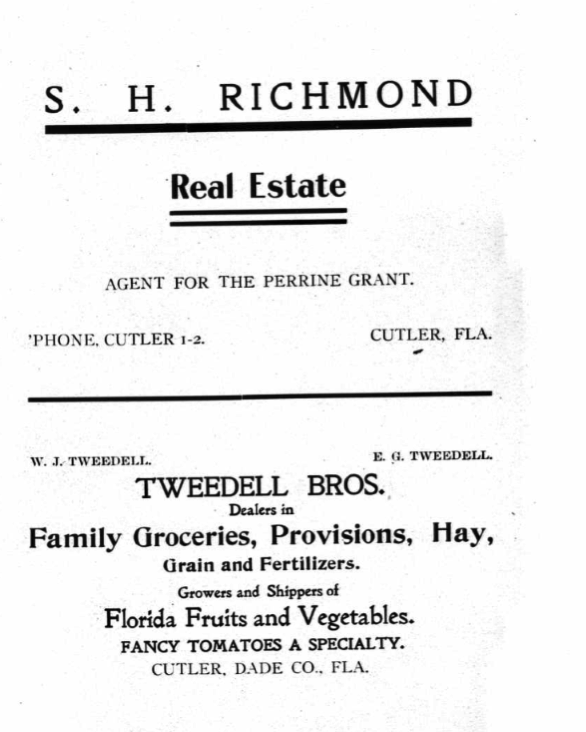 Free’s obituary, which appeared in the November 13, 1928 issue of the Homestead Leader, mentioned that Tweedell bought Free’s store. 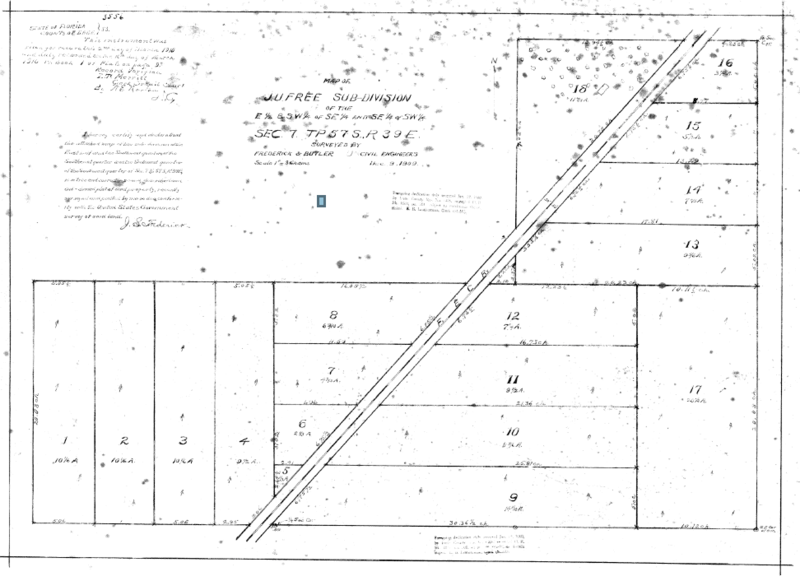 On August 29, 1913, he bought the “northwest half of lot 5 in block 11, of Homestead.” The only plat that matches this description is the original plat of Homestead, as recorded in book B, page 144. If my surmise is correct, then the lot that Tweedell bought was at the corner of Homestead Avenue and 2nd St., just a short distance from his store. The sellers were Fred S. Loomis and his wife, Jessie. Walter was well-connected in town, as his wife and James D. Redd’s wife were cousins. It is not surprising to learn that Maisie was an early member of the Homestead Women’s Club. Walter must have been the gregarious sort, as not only was he the owner of a general merchandise store, he was also a member of the Board of County Commissioners, a position he was to hold until his health failed and he resigned his seat immediately after he had been re-elected in November of 1920, having served since 1912. J. D. Redd received confirmation that he had been appointed to the vacant commission seat by Governor Hardee on January 18, 1921. Walter spent some time in Tucson, Arizona, where he had relatives, in an attempt to regain his health, but he was unsuccessful. He died on September 16, 1921 in Homestead and the services were conducted at the Methodist Church, according to his obituary, which appeared in the Miami Herald on September 17. He was buried in the Palms Woodlawn Cemetery in Naranja. After Walter died, his widow married James A. Daugherty. James Daugherty was in real estate and lived at 100 E. Mowry in 1927. Maisie is buried between her first and second husbands, with her son and his second wife, Lula Eldeen Dows (neé Teel) buried at her feet. Carl was a movie projectionist who probably started out his career by working for Jim English at the Seminole Theater in Homestead. His first wife, Mae Sayers, a daughter of William David Sayers and Lydia Charlotte Vihlen, is buried in Ocala, Marion County, Florida. Carl and Mae had two sons, Walter D. and Jack A., so a fuller understanding of Walter Tweedell’s contributions to the Homestead and Dade County area may yet be discovered. When I first started writing articles for this website, I decided that I would explore the lives of people mentioned in early newspaper articles about Detroit, now known as Florida City. I subsequently posted essays on James M. Powers, William C. Norwood, the Brooker brothers, Bryan H. Edwards, and John and Florence Hunt. With this post, I’m going to switch to Homestead residents and explore the life of the Reverend Joseph Adolph Kahl. It is a fascinating story and one that I could not have written without the able assistance of Linda Bebee, a researcher in South Miami and Louise Kahl Young and Stephen Kahl, both of whom live in Texas. This post will be part of a series, because Joseph Kahl was a very important man in the early history of Homestead and he tragically lost his wife in 1913, barely two years after he moved to this area. The story cannot be told in one post because it would be too long. Joseph Kahl was born in Rock Island County, Illinois in March of 1871, according to the 1900 census. His death certificate, kindly furnished by Louise Kahl Young, states that he was born on May 12, 1871. He was one of eight children born to Detlief and Wilhelmina Kortrum Kahl. In 1876, when Joseph was just five years old, his mother died and his father re-married to Anna Tegtmeier on March 31, 1877. She brought three of her own children to the marriage and had three more with her new husband, creating a family of two adults and fourteen children. After his first wife died, Detlief Kahl moved across the Mississippi River to Muscatine County, Iowa. From there, the family moved to Jasper County, where Joseph’s sister, Mary, was born. They then moved to Hardin County, where they settled down and stayed in Sherman Township. The Kahls must have been deeply religious because a Kahl family history states that their home was “the center of religious meetings and a place where traveling ministers would stay en route to their churches.” They must have also placed a high value on education because after Joseph completed his primary education he appeared in the 1900 census of St. Paul, Minnesota, living in the household of Emma Wenger, while he was attending school at Hamline University, a Methodist institution. In 1905, he appears on the Minnesota state census as a clergyman at Hamline University. At that time, he had lived in Minnesota for 9 years – since 1896. As he was 34, it appears that he had completed his seminary work and was a clergyman at the University, because that is what is listed as his occupation. The Methodist Church sent Joseph to Driscoll, North Dakota, perhaps at his own request. George Kahl, one of Joseph’s brothers, had filed a claim in Burleigh County in 1903 and proved it up in 1908. In 1905, Joseph filed a claim on 160 acres, the N 1/2 of the SE 1/4 and the N 1/2 of the SW 1/4 of section 26 in T138N, R75W in Burleigh County and proved it up on May 2, 1910. A check of the Burleigh County newspapers in the period from 1905 to 1910 reveals a number of instances in which Joseph Kahl is mentioned. He was the pastor of the Methodist Church in McKenzie and preached in a number of other places in the county. 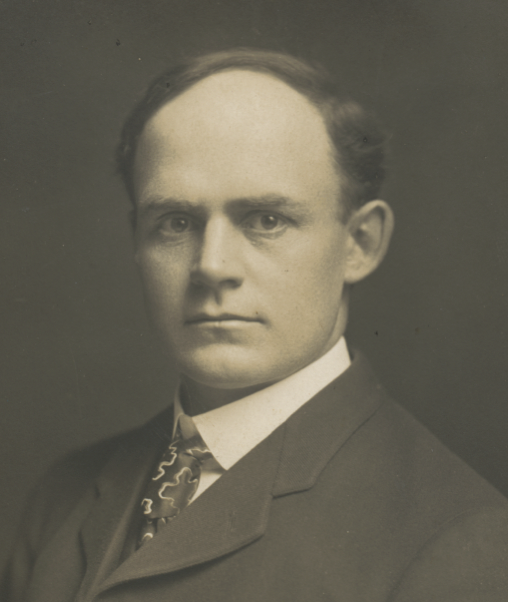 On October 11, 1910, he participated in the Methodist Conference in Bismarck. There are no further mentions of Rev. Kahl after that date, so presumably he left for Florida after that date. The town of Driscoll, in Burleigh County, is an important location to keep in mind in this series on Joseph Kahl. Now, I need to pick up the story of Harriet Mae Woodbury, the future wife of Joseph A. Kahl. Harriet Mae Woodbury was born in an immigrant wagon on the banks of the Blue Earth River, near Blue Earth, Faribault County, Minnesota on November 1, 1876. Her parents were Charles H. Woodbury, Sr. (1850-1936) and Myra Maude Little (1856-1939). The family moved north, to McDonaldsville, Minnesota in 1880 and then to Ada, Minnesota. They then moved west to Forest River, North Dakota, before moving once again, south, to Abercrombie, North Dakota, about 190 miles east of Driscoll. Sometime between 1906 and 1907, they packed up and moved again, to Driscoll. While all this family moving was going on, Harriet was busy getting an education. She attended primary school in Grand Forks, North Dakota and then went to high school in Montpelier, Vermont, where her aunt, Mrs. C. A. Gale, lived. Finishing high school, she taught school in Abercrombie and Wahpeton in North Dakota. In 1903, she registered at the Still College of Osteopathy in Missouri and graduated in 1905. Somehow, she also found time to file a claim for a homestead on 160 acres in Burke County, North Dakota, way up in the northwest corner of the state, in 1906. There, for a period of time, she taught school in Portal, right on the border with Canada. She didn’t receive a patent on this property, though, as she abandoned the claim in less than a year, deciding instead to do post-graduate work in osteopathy in Los Angeles, California. In the fall of 1907, she returned to Driscoll to visit her parents, who had moved from Abercrombie and entered the hotel business. In an article which appeared in the December 11, 1907 issue of the Bismarck Daily Tribune, we read that “Dr. Harriet M. Woodbury, osteopath physician, is now located in her office at the Woodbury hotel. Dr. Woodbury comes here very highly recommended from Los Angeles, Cal., and Driscoll is to be congratulated in having so good a physician locate here.” On May 28, 1908, Dr. Harriet Woodbury was elected fourth vice-president of the Driscoll Epworth League. Her sister, Ellen A., wife of Irwin Roy Matthews, was elected secretary. The Epworth League was an organization for young people, ages 18-35, in the Methodist Church. It is not unreasonable to conclude that she met Reverend Joseph A. Kahl through her activities in the Epworth League. 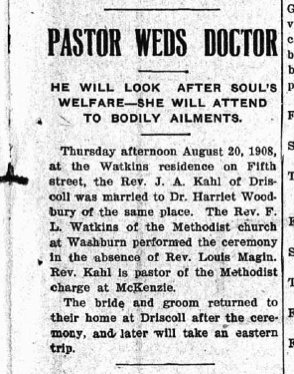 On August 20, 1908 she and the Reverend were married. She was 32 and he was 37. In part 2 of this series, I will continue exploring the lives of Rev. Joseph A. Kahl and his wife, Harriet, after they arrived in South Florida. In my post on Walter Arthur Frazeur, I mentioned John U. Free in connection with telephony in early Homestead. In this post, I want to present a brief biography of him. I am aware that there is an extensive account of the J.U. Free family in Jean Taylor’s book, but her account has a number of errors in it. Ms. Taylor wrote an invaluable account of early life in South Dade, but much of it appears to have been based on oral history and oral history is often muddled or incorrect. What follows is from documented sources such as the federal census, marriage and death records, and other publicly available sources. John Ulric Free, Jr. was born in Senoia, Coweta County, Georgia on March 6, 1881. His father, who was John Ulric Free, Sr. (1833-1884), was from Switzerland. His mother, Emma Allen (1849 – 1917), was from Georgia. John U. Free, Sr. died in 1884 and is buried in Coweta County, Georgia. After her husband’s death, his widow, Emma Adeline Allen, married Charles J. Burton in Meriwether County, Georgia on 26 December 1888. By her second marriage, she gave birth to Joseph Lee Burton in October of 1889 and Dewitt Burton in May of 1893. In the 1910 census of Atlanta, Georgia, the occupation of both Charles J. Burton and his son, Joseph L. was “groceryman.” In the 1920 census of Homestead, Charles, 60, widowed, was living in the household of Joseph Lee and Robbie Lee Massey Burton, his son and Joseph Lee Burton and John Ulric Free, Jr. were half-brothers. Dr. Joseph Massey Burton and John U. Free, Jr.’s son, John U. Free, were first cousins. Henry Brooker, Sr., Sid Livingston and William D. Horne founded the Homestead Mercantile Company in July, 1912. Joseph L. Burton opened a store in the Horne Building, on the other side of Krome Avenue from Homestead Mercantile, in the early 1920s. At some point thereafter, Burton took control of the Homestead Mercantile Co. and renamed it Burton’s. Burton’s daughter, Miriam, married Lonnie Hood and the store later became Hood’s Department Store. Prior to the founding of Homestead Mercantile, the “go to” store in Homestead was the Campbell Brothers Store, located just south of the Homestead Inn on Railroad Avenue. That store burned down on November 10, 1913 and was not rebuilt until 1921. In 1900, John U. Free was enumerated at the Columbia Barracks, which was near Havana, Cuba. 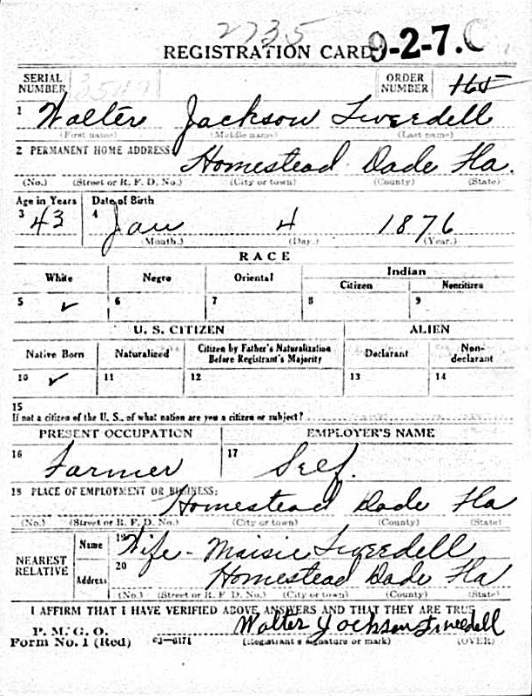 He was a private in the U.S. Army hospital corps, having enlisted in Savannah, Georgia on December 13, 1898 at the age of 18 years and 8 months. At the time he was enumerated, his address in the United States was in Atlanta, Georgia. He was discharged from the Army at Camp Wallace, in Manila, Philippine Islands, on December 12, 1901. His wife, Lula Carmichael, was from Tift County, in southern Georgia. They were married on November 2, 1904 in Berrien County, Georgia. I don’t know what John was doing in Berrien County, which is in south central Georgia, but it had experienced a population boom of 81% between 1890 and 1900, according to Wikipedia. No doubt, he was there to work. According to Jean Taylor, Free owned a grocery store in St. George, Georgia, which had been founded in 1905. St. George was a boom town for several years but because its founders didn’t follow through on their promises, settlers began to leave. The Georgia Southern & Florida Railway, which passed through St. George on its way to Jacksonville, may have furnished Free with an easy means of leaving town, for he then moved to Palm Beach in about 1906. The 1910 census for John U. Free is very interesting. He appears in two different censuses: one in Key Metaenabe, Florida (Key Matecumbe) on April 29, 1910 and again in Homestead on May 2, 1910. According to Jean Taylor, the Frees were in Bahia Honda when a major hurricane swept over the area on October 12, 1909 (hurricane eleven). Again according to Taylor, Free had been given a job by William Krome as a foreman for Flagler’s railroad in the Keys. He was enumerated while in the Keys and also in Homestead where his property was located. I don’t doubt that he knew he had been counted twice, but he must not have given the matter any thought. There was a provision in the Homestead Act of 1862 which granted a veteran the time he served in the military towards the five year time requirement for proving up a homestead claim. 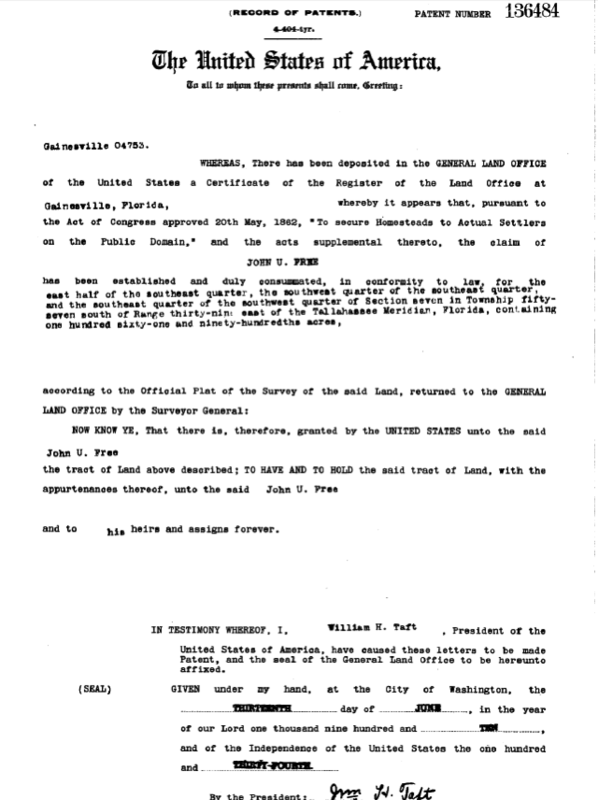 Apparently, that provision was amended to include veterans of the Spanish-American War, as John filed his claim on November 7, 1907 and only spent 31 months on his land before receiving the patent (136484) on his claim on June 13, 1910. He had claimed the E 1/2 of the S.E. 1/4, the S.W. 1/4 of the S.E. 1/4 and the S. E. 1/4 of of the S.W. 1/4 of section 7 in T57S, R39E. That property straddles S.W. 172 Ave. (theoretical McMinn Rd. ), north of S.W. 312 St. (Campbell Drive). 40 acres of the homestead extended from S.W. 308th St. (now N.E. 11th St.) on the north to S.W. 312 St. on the south on the west side of theoretical McMinn (it stops at N.E. 11th St.) and the eastern border of the remaining 120 acres of his homestead, an L-shaped parcel, was Tennessee Road. His property was bisected by the FEC, which pretty much ran through the middle of it. Much of J.U. Free’s property is now taken up by commercial parcels on both sides of U.S. 1. north of N.E. 8th St.
John and Lulu’s daughter, Annie Vivian, had been born on August 23, 1905 in Georgia and, according to Jean Taylor, she and her mother had arrived in Homestead in December of 1907 from Palm Beach, where her husband had been a “bridge foreman.” Presumably, John was employed by the FEC there, but apparently not for long, as he filed for a homestead in November 7, 1907 in this area. 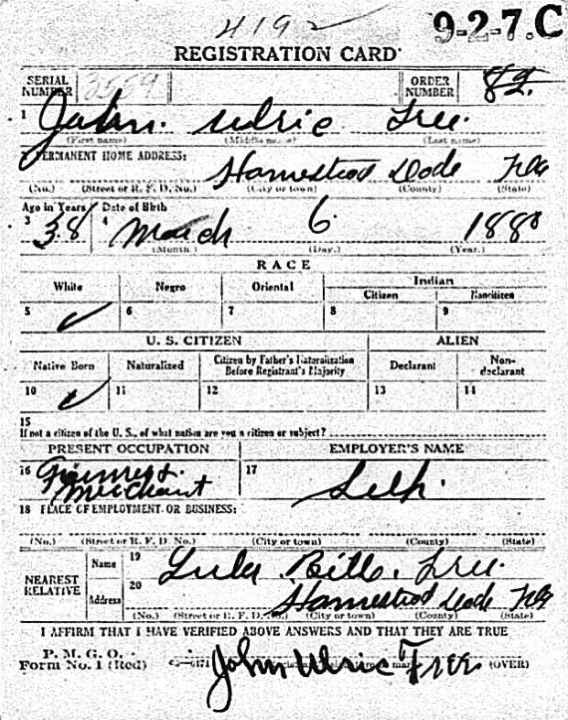 John and Lulu’s first son, John (he should have been a III), was born on November 8, 1910, apparently in Homestead. Their third child, Wilbur Allen, was born on March 23, 1915. An interesting sidelight to the names of John Ulric Free, Jr.’s children: they were named after his father (John Ulric), his brother, Wilbur Allen (1882 – 1900) and his sister (Annie, ca. 1885 – ?). He apparently believed in keeping everything in the family and in confusing future researchers! John’s WWI draft registration card is very interesting: it was signed by W.D. Horne, the registrar for the board, on September 12, 1918. On the card, John gives his occupation as “Farmer and Merchant” and signed his name as John Ulric Free. Taylor says that Free was something of a real estate developer, because he “bought 50 acres and cut it up into lots for Homestead’s first subdivision.” He was, indeed. Free hired Richard L. Bow to subdivide his homestead, for which he had not yet received a patent (that happened in 1910) in late 1909. In 1911, he recorded a plat for 1.5 city blocks at Krome and Mowry. In 1913, he recorded J.U. Free’s 2nd Addition, a portion of his original homestead that had been subdivided in 1909. Taylor was right about Free being a developer, but I have not yet found the 50 acres that she says, in her book, that Free bought to subdivide. Other names that appear on the plats from 1910 – 1912 are Brooker, Walbridge, Miller, Horne, Moser, Beidler, Hogard, Tatum and King. In 1913, in addition to Free, there were at least eleven other subdivisions recorded. Real estate sales were booming, likely because of the completion of Flagler’s railroad in 1912. Free built a number of buildings in the downtown Homestead area, including a two story building south of the Bank of Homestead that later was known as J. D. Redd’s store. This store is not the same one as shown in the picture of J.D. Redd’s store in my post on J. D. Redd, though. That store was built adjacent to the one shown here – the wooden building in this picture was torn down and the new one was built in 1922 if the date at the top of that building is correct. This store is where the Dade County Telephone Company was located, on the second floor. Ms. Taylor, in her book The Villages of South Dade says that it was J. D. Redd’s dry cleaning store. It was later, but at the time that the Dade County Telephone Company was established, the building was owned by J. U. Free. So the correct story is that the Dade County Telephone Company was on the second floor of J. U. Free’s store, not J. D. Redd’s store. He also built a grocery store before 1910 on the east side of Flagler, opposite the Depot, which would be in the area where Pan American Satellite formerly had its operations. He later sold this store to Walter Tweedell. After he sold the grocery store, he opened a department store at 11-13-15 S. Flagler, which was between the present Redland Hotel and the Landmark Hotel. A two-story wooden building which he built as a rental property still stands behind the present one story storefronts where Free’s store once stood. Free had his fingerprint on just about everything in the early days of Homestead. I haven’t proven it, but he may have had connections to the Redd family too (besides business), because there was a DeWitt Talmadge Burton who lived not far away from the Redds in Aiken County, South Carolina. This may have been the same DeWitt Burton who was the younger brother of Joseph L. Burton. John Ulric Free died on November 11, 1928 at the age of 47 and is buried in Palms Woodlawn Cemetery in Naranja.